» Persistant world discussion » Persistent World Discussion » How to play. Don't write anything yet but we need a quick guide on how to play. How you can join peoples RP's and how you can create your own RP, a list of rules if we have any and how to do other things like that. Omg, you got your 69th post! lol Ok I agree maybe a few guidelines. It should be free form. Just seems like more rules and guidelines to turn people away. People didn't know how to play in the last game, they needed help. What exactly is stupid? Opinions are welcome are they not? Just voicing mine. This is not a role-play with a million GM's it is a world to role-play IN. Narrow down player options by rules and guidelines and no one will want to play. a few rules to look at before jumping in? Yes. I think it should be simple. Lets make the threads places instead of specific stories. So while Bob a Jill are on a date in The City the go to The Bar and the decide to go walking along The Lake and the go back to Jill's House. sort of like a HUB for each place? Yeah I think so. We had a section called Outside and it covered an endless plane of wilderness, alot of fights went on there, there was grass, trees, cows whatever you wanted. We also had slightly stricter places like The Lake and we characterized that by saying it was a large deep lake surrounded by woods and there was a cabin not too far from the shore at one spot. It was a smaller area but was large enough for our purposes. We still kept this all persistant though and corrected new comers quickly but kindly. There were hundreds of pages for each area becuase the forum had been around for so long so reading each area's history wasn't practical. An example was the Arena, one fight tore it to ruins and hwen a new guy made a post that didn't depict that, the senior members just told him the page to go to and a quick summary of what the place looked like now it was simple. We won't be as specific becuase we are covering an entire planet and not just one country like my old forum was but it gives the basic idea. I don't think people should be allowed to create there own area ingame unless we have a sort of safe system, E.G houses can be bought and the inside can be however you want it to look but you can't just plonk a nightclub somewhere, it needs to be built. if I create a money system (don't worry, I'll make it impossibly simple) I'll put some empty warehouses/land on the map for people to play around with. Also, adventures would still work because you post an OOC and then move from place to place, I love it. Oh yeh, I need to do that. I will, anyway we can still do locations. I'd love the idea of having a grid map, and we need suicide booths aswell. A maps possible, I'm not going to keep track of where everybody is. If we do have a money system all money that is spent or gained should be done through a sort of thread Market. So, if someone spends some money somewhere they go to the thread and say how much they have lost and who has gained that money. If someone loses 10g to me it would be written. And so whatever you spend and who gets the money is the main thing, to fu the economy everyone starts with 10g. Foolproof and I can easily add or take away numbers. The problem however is people not completing transitions of trade, if that happens post it in the report thread unless we can use the report function for PW only. People don't 'not play fair' consitently, if they do that we can issue a warning but usually an official looking PM will scare there socks off and they won't do a bad deed ever again. I'd rather avoid a money system int he PW. As simple as it sounds people really don't want to be bothered with having to set aside some time for working or for posting their everyday transactions in a thread. I think we should use the bottomless backpack rule. This rule basically says that whatever item of insignifigance you happen to want or desire at the time can indeed be pulled out of a pack which has virtually no limit. In combat this rule basically doesn't exsist and in life or death situations one must account for the time it would take to remove said object. Essentially If I happen to need a band-aid or our PW's equivilent to a band-aid then I just reach into my pack/pocket/cloak/ whatever and pull one or a box out. Same thing for lighters, keys, a spy glass, a water bottle, ect. As long as people are reasonible and don't abuse this freedom it should work if they abuse it then they alone take the punishment and if we have repeating problems we can always say "We gave you guys a foot and you took a mile so here is your new leash" and lap a money system like the one Hex suggested onto the PW. Now some of us have already started out with demo cash. This happened when I was setting up the rules and it awards the points based on how many posts you have already made, and how many threads, etc. After readjusting the rules to what they are now, obviously, it doesn't correct itself, but I'm not going to worry about that at the moment. The following is an image of a store system I've initiated at another site I own using Flash (via Wix). 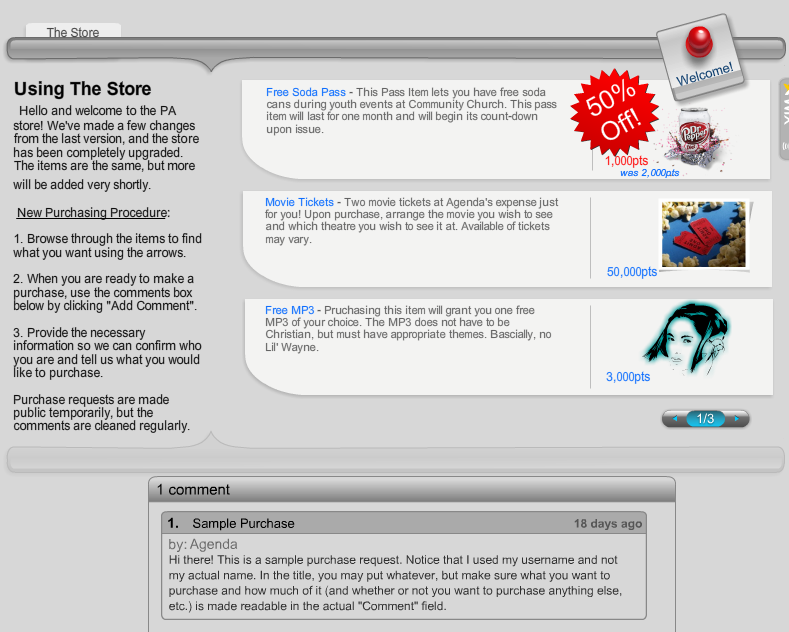 I have the students use the comment system I've enabled directly in the store to post up what they want to purchase. I then subtract the points they spend and allow them to use the item. This store system has actually proven to be very effective. I think we should at least give it a shot. Also, The whole money thing seems too much. Again, your pushing Persistent world into something 'complex' which might seem cool and grand right now, but later is just going to confuse people and then we lose interest. 24 Re: How to play.